Large Long Drapes - Window Treatment for Big Windows - Sew What? Sew Anything! Color and function were the most important things to keep in mind for this client’s window treatments – large long drapes were the solution. My client wanted some color in her home and also wanted to cover the large windows and transoms in her living space. 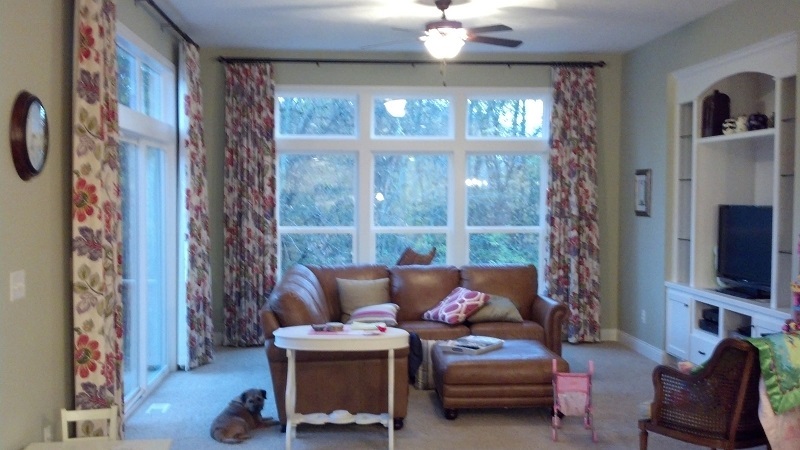 After selecting the right pattern and color, we used over 44 yards of fabric to cover both large window openings. The window treatments became the biggest design statement in this room. Draped well, large long drapes can look fresh, dramatic and exciting. Covering these huge windows called for some special hardware. I used my drapery hardware that gave this room a casual yet elegant drape. They look great open, and fabulous closed for privacy and sun protection. The drapes are 109 inches long and both window openings span 140 inches.